This year's Cesar Chavez celebration is on Saturday, April 13 in San Francisco. Highlights for the day include a parade and street fair in SF's Mission District. This annual festival commemorates the life and work of the labor and civil rights leader, Cesar E. Chavez. Early on in life, Chavez noticed unfair work practices for farmer and migrant workers. As he grew up, he knew he wanted to do something about it. In 1962, he founded the National Farm Workers Association (later known as the United Farm Workers or UFW). With this union, workers had support in the fight to improve their working conditions. The union grew slowly at first. However, with Chavez's tireless leadership, the union grew to more than 50,000 members by 1970. It's still one of the most active unions today. The parade for the Cesar Chavez Holiday Festival assembles at 10am in Dolores Park at 19th and Guerrero Streets, and officially kicks off at 11am. The parade makes it way from Dolores Park to the street fair in the heart of the Mission. This year's street fair is from 11am to 6pm. All activities will take place on 24th Street between Treat and Bryant. All afternoon, you can enjoy music, dancing, and sidewalk sales with local vendors. This year's event also features two live music stages. Dozens of artists will display their unique pieces as well throughout the festival. If you love classic cars, make sure to stop by this year's Classic Car Show on Harrison Street at 24th. From Union Square: The easiest way to get here from Union Square is to take the underground BART train from Powell Station. Get off at the 24th Street Station in the Mission and head east to the festival. You will cross both Van Ness and Folsom Streets to reach it. From Fisherman's Wharf: From Fisherman's Wharf, take the F streetcar from Jones and Beach to 2nd and Montgomery. From here, take the underground BART train to the festival (following the direction above from Union Square). 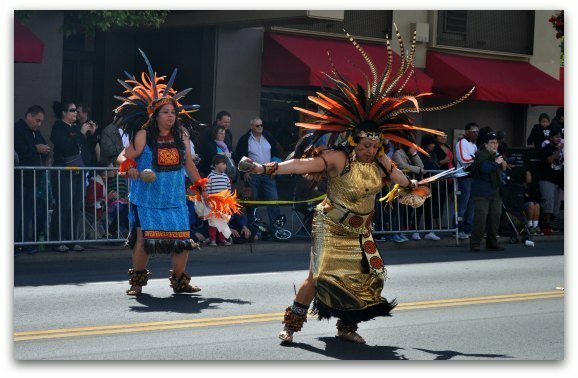 From Civic Center: You can also take the BART train from the Civic Center District to the Cesar Chavez Holiday Festival. Pick it up at the Civic Center Station and head south to the 24th Street Station. From the East Bay: If you are coming in from the East Bay, I also recommend BART. Parking in the district can be tough, so taking the train in is easier than driving. From the North Bay: From the North Bay, I recommend taking the express Golden Gate 101 Bus. Take it to the Civic Center (hop out at Hyde & Grove) and walk to the Civic Center BART Station. Take BART to the 24th Street stop and you will find the festival just three city blocks east. From the Peninsula & the South Bay: BART is also your best bet from the Peninsula or the South Bay. Drive to the Millbrae station and then take BART to the 24th Street Station in the Mission. If you decide to drive, you might get lucky and find street parking in this district on a Saturday afternoon. However, you will most likely need to park your car in a garage. Click here for some of the best places to park in SF's Mission District. If you are interested in staying near the festival, you will find a few nice lodging options right in the Mission. Many are smaller boutique hotels and bed and breakfasts. Click here to find a list of hotel recommendations for the Mission. Cherry Blossom Festival: Another popular April festival in San Francisco is the Cherry Blossom Festival. This annual event celebrates the official start to spring as the cherry trees start to bloom. Other SF Festivals and Street Fairs: Each weekend in SF, you will find a fun festival or street fair. They range from the Cesar Chavez Holiday Festival to the large North Beach Street Fair in June. Click the link above for this year's schedule. Mission San Francisco de Asis: The oldest building in San Francisco stands on the western side of the Mission District. If you have an extra hour or so before the festival, I recommend stopping by for a visit. This mission was built in the late 1700s and is a gorgeous display of California's famous missions.